As electronic gadgets and internet technologies have gained vast success, there are hundreds of real-life applications have surprised the world never before. Right from tracking your health measures to tracing your heart rates, these electronic devices can measure almost everything of a human body. Not only they measure the health parameters, but also provide a brief analysis of your health data, what to do and what to avoid. We have summed up some of the best health gadgets for your routine checkup. 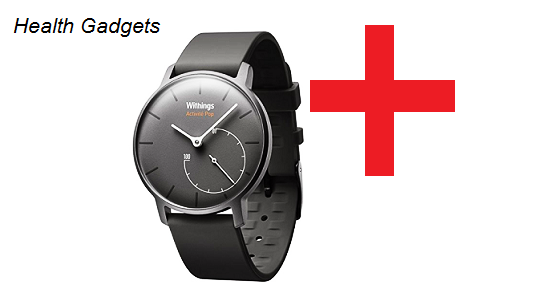 An elegant fitness tracker-watch hybrid designed by French company Withings and can measure a lot of your activities. It can measure your sleep, walking steps, how much calories you burned and much more. The trouble of air pollution in most of the city areas? This compact size USB device called as Atmotube 2.0 by NotAnotherOne can measure air quality anytime quickly with accurate results. It indicates the harmful gases and volatile organic compounds levels in the surrounding air while also measuring air temperature and humidity. Even though Google Glass project didn't work very well in the consumer market, its day to day health applications is limitless. Perfect for many industries, Google Glass can measure digital sensors readings and transfer them over smartphone or tablet for analysis. Doctors can easily access their patient's records, collaborate the surgery while seeing patient's vitals and so on. TechCare Massager Touch is one of the revolutionary product for all those patients who are in pain such as related to sciatica, arthritis, Carpal Tunnel and many more. It features a combination of Transcutaneous Electrical Nerve Stimulator (TENS) and Powered Muscle Simulator (PMS) which delivers low voltage pulses to the skin and stimulates nerve fibers, blocking the pain signals to your brain. MobiUS SP1 is world's first smartphone ultrasound imaging device which can help thousands of patients staying in remote areas. Developed by Mobisante, this small, portable wand is not compatible with iOS or Android operating but comes with Toshiba TG01 handset running windows mobile os 6.5. Not only it can help to monitor pregnancies but also various abdominal, cardiac, pelvic and peripheral vessel scans. GLO is a product by GLO Science – which is a winner of the Thomas Edison Award for design and innovation. This high tech teeth whitening device uses ground-breaking patented technology G.L.O. (Guided Light Optic) to deliver professional, long-lasting results at home or anywhere they are. Now doctors can easily examine their patients closely with the AccuVein AV300 Vein Viewing System. This handy gadget makes viewing clumps and other issues with veins simple yet accurate. It is so lightweight and small that doctors can carry it around easily. When it comes to on-the-go blood pressure monitoring, it doesn’t get more easily than Nokia BPM+ blood Presterilizingor. Combining ergonomic and minimalist design with innovative technology, the compact health gadget is extremely easy to use and synchronizes with your smartphone via Bluetooth easily. This tiny, FDA-cleared mobile EKG monitor from AliveCor allows a user to track their heart rate anytime, anywhere. When combined with its dedicated app, Kardia Mobile delivers a medical-grade electrocardiogram (ECG) and transfers to your smartphone in just 30 seconds. A true gift for those who are in real need. The AliveCor ECG system consists of a heart monitor sensor built in a tiny gadget that connects to a smartphone app easily. Patients can use it to record their ECG reading, which can then be shared with their doctor and those reports can be integrated into the PHR (patient health record) later. Complete with 7 electroencephalography (EEG) sensors, Muse, a lightweight headband can accurately monitor your brain activity during meditation and transmits the information to your computer, smartphone, or tablet over Bluetooth. The Wacom Intuos system quickly converts what you write into a digitally readable format. It consists of a tablet which is basically a touch-sensitive pad and a stylus. Now doctors can write clinical notes, prescriptions and draw directly on x-rays and charts. Made by iHealth Lab Inc, the Wireless Smart Gluco-Monitoring System is a state-of-the-art, FDA approved glucometer that measures glucose levels in the blood. The readings are then synced to your smartphone app. The innovative health gadget features a sleek, portable design and is compatible with iOS devices. Now measure your BAC levels and smartly adjust your alcohol intake. Alcohoot is a mobile breathalyzer that connects to your smartphone through an app and keeps track of your alcohol intake. This small gadget uses the same technology which police use to handle people who cross alcohol intake limit while driving. As the name suggests, BodyGuardian Heart allows healthcare practitioners to measure patients with cardiac arrhythmias and easily send the data directly to the service’s cloud platform. The UV-C light emitted by Verilux CleanWave UV-C Portable Sanitizing Travel Wand eliminates up to 99.9% of bacteria and viruses found on the surfaces we touch every day. Let us know which gadget you liked and what's your recommended products.